"Despite considerable rhetoric from politicians about cutting spending and reducing the size of government, there’s been little in the way of actual results. At best a few promise for future cuts have been secured, but we know what those are worth. A good measure of the seriousness, or lack thereof, with which Congress approaches cutting wasteful spending is the funding level of the OECD, a Paris-based bureaucracy that advocates for higher taxes and bigger government." "The original idea behind the OECD when it was founded back in 1960 was to have it promote trade between developed nations. It has devolved into a big-government wealth- redistribution engine with an international reach. It promotes among other things VAT taxes and Keynesian policy. "The money it administers often goes to corrupt and oppressive governments. Not only are your tax dollars funding this, but the people whose salaries are financed by your tax dollars have been authorizing it. And while the OECD may want to redistribute money from developed nations, its employees apparently have no compunctions about living large themselves, with nice offices in the City Of Lights and tax free salaries. "All on your nickel. And the OECD needs a lot of your nickels. It has an annual budget of 400 million dollars and you are picking up the tab for about 22 percent of that." And be sure to bookmark the CF&P website where you can find more information about their efforts to "preserve jurisdictional tax competition, fiscal sovereignty, and financial privacy – and the Double Taxation Working Group, which is committed to abolishing the capital gains, dividends and death taxes." "What Milton Friedman is best known for as an economist was his opposition to Keynesian economics, which had largely swept the economics profession on both sides of the Atlantic, with the notable exception of the University of Chicago, where Friedman was both trained as a student and later taught. "In the heyday of Keynesian economics, many economists believed that inflationary government policies could reduce unemployment, and early empirical data seemed to support that view. The inference was that the government could make careful trade-offs between inflation and unemployment, and thus "fine tune" the economy. "Milton Friedman challenged this view with both facts and analysis. He showed that the relationship between inflation and unemployment held only in the short run, when the inflation was unexpected. But, after everyone got used to inflation, unemployment could be just as high with high inflation as it had been with low inflation." Dr. Sowell's column, as usual, is well worth a complete read. "It's a tragedy that Milton Friedman—born 100 years ago on July 31—did not live long enough to combat the big-government ideas that have formed the core of Obamanomics. It's perhaps more tragic that our current president, who attended the University of Chicago where Friedman taught for decades, never fell under the influence of the world's greatest champion of the free market. Imagine how much better things would have turned out, for Mr. Obama and the country." "The subsequent six decades were no different. The 2008 financial crisis provided just such an excuse: “an opportunity to do things that you could not do before,” said Rahm Emanuel, President Barack Obama’s first chief of staff, outlining the administration’s crisis-management strategy following the last election. "Obama left the details of his $831 billion fiscal stimulus to the Democratic-controlled House of Representatives, which proceeded to lard the bill with pet projects that had little to do with stimulus and everything to do with priorities (tax credits for renewable energy, for example). "As for full employment and economic growth, there’s little to show for $5 trillion of newly minted debt since Obama took office. “The federal budget has if anything been itself a major source of disturbance and instability.” -- Chapter V"
U.S. Senator Tom Coburn, M.D. (R-OK) released an oversight report today on job training programs in Oklahoma entitled, “What Works (and What Doesn’t): The Good, Bad and Ugly of Federal Job Training in Oklahoma. This report was the result of an exhaustive year-long review of job training programs in Oklahoma that included 70 field interviews and meetings with officials. "The overlap and duplication in job training programs created by Congress has resulted in the State of Oklahoma having 40 different federally funded job training programs located across more than 180 different locations, operated by at least 45 different entities, costing $164 million, assisting Oklahomans in finding work. Ironically, many job seekers in the Sooner State do not even know that most of these programs even exist. This report will examine Oklahoma’s programs and the issues of unnecessary duplication, severe fragmentation, training-related employment, and cost discrepancies which are all indicators of the need for change. "The convoluted mess of job training programs exists, not because of any well-meaning Oklahoman, but because Congress created a system that is doomed to fail. Employers and communities know best what skills are needed for a successful workforce, not bureaucrats—despite good ntent. "What part of this scenario makes sense: Congress taxes Oklahoma employers at record rates, to fund job training programs created by politicians in Washington, only to send taxpayer money back to Oklahoma with rules and regulations that tie the hands of state and local governmental and business and ignore the unique economic and demographic factors of their communities. This scenario is the reality of the employment programs operated by federal government. "The first step Congress took in the wrong direction was a step out of the Constitutional boundaries set forth by our founders. Providing employment and training services is not a role for federal government at all, according to the enumerated powers listed in the U.S. Constitution." The report is obviously directed to Senator Coburn's home state of Oklahoma, but I have no doubt that most if not all of the report would apply to federal job training efforts in Virginia. Now, if only Virginia's Senators Jim Webb and Mark Warner were as fiscally responsible as Senator Tom Coburn. Kudos to Senator Tom Coburn for his efforts to bring fiscal sanity to the U.S. Senate. On Wednesday, July 25, we growled about the current economic recovery being the worst since 1945 while on July 17, we growled about the economic news Federal Reserve Chairman Ben Bernanke provided to the U.S. Senate Banking Committee. "The world’s largest economy has suffered a worrying loss of momentum with US growth slowing to an annualised rate of 1.5 per cent in the second quarter of 2012. "The pace of growth is now too slow to bring down unemployment, threatening both the global economic recovery and the re-election prospects of President Barack Obama. "The figure, which was broadly in line with market expectations, will add to the Federal Reserve’s fears about progress towards higher employment but may not be alarming enough to force immediate action at an interest rate meeting next week. “The latest GDP data show a more shallow growth recovery and a near term pattern of weakness that supports a case for more accommodation from the Fed,” said Eric Green, chief economist at TD Securities in New York." "Growth at or below 2 percent isn't enough to lower the unemployment rate, which was 8.2 percent last month. And most economists don't expect growth to pick up much in the second half of the year. Europe's financial crisis and a looming budget crisis in the U.S. are expected to slow business investment further. "The main take away from today's report, the specifics aside, is that the U.S. economy is barely growing," said Dan Greenhaus, chief economic strategist at BTIG LLC. "Along with a reduction in the actual amount of money companies were able to make, it's no wonder the unemployment rate cannot move lower." However, Bloomberg reported: "The first year of the recovery from the worst U.S. recession in the post-World War II era was even weaker than previously estimated, evidence of the extent of the damage wreaked by the economic slump, revised figures show." "President Barack Obama's budget office on Friday revised downward its previous forecasts for economic growth in 2012 and 2013 and projected a $1.211 trillion deficit through the end of the year, slightly down from earlier predictions. "The economy is not growing fast enough and there are still too many people out of work. Most troubling, the pace of improvement in the labor market slowed in the second quarter of this year," according to the Mid-Session Review (MSR) from the Office of Management and Budget (OMB). "Obama's hopes for re-election hang on voters' perceptions of how he has handled the economy, which is still sputtering three and a half years after he took office. Polls show Republican challenger Mitt Romney is seen as a better candidate for creating jobs, though the president outscores him on which candidate would be a better champion for the middle class." "President Obama didn't comment on Friday's report of declining growth in the second quarter, and that's no surprise. The economic story of his Presidency is by now familiar: a plodding recovery that has taken its third dip in three years and is barely raising incomes for most Americans." "Two reports came out in the same week. One was from the Pentagon, saying that, in just a few years, Iran will be able to produce not only a nuclear bomb but a missile capable of carrying it to the United States. The other report said that the American Olympic team has uniforms made in China. This latter report received far more attention, both in Congress and in the media." Yesterday, we cited an op-ed in the Washington Times’ commentary section lauding the life of Milton Friedman on the centennial of his birth. However, the commentary section’s front-page featured an op-ed by Steve Forbes, editor-in-chief of Forbes magazine, in which he argued the current economic recovery cannot wait until the November elections. “What is frustrating is that with elections looming in November, the administration seems interested only in politics, despite having many policy options at its disposal that would immediately boost economic certainty and aid job creation. growth, says the GOP leader of Congress's Joint Economic Committee. “Texas Congressman Kevin Brady, the top Republican on the Joint Economic Committee, observed that the June Employment Report released today by the Bureau of Labor Statistics along with the gross domestic product report released by the Bureau of Economic Analysis on June 28th has marked a milestone: President Obama’s economic recovery ranks as dead last in the post-World War II era. 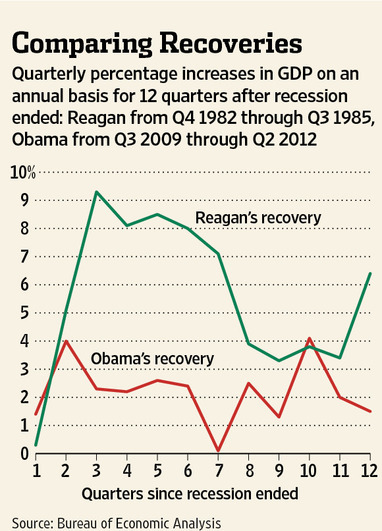 “Since 1945, the United States has had ten economic recoveries that lasted more than one year. In terms of both how fast the U.S. economy has recovered and how many private sector jobs have been created since the recession's low point, President Obama now ranks tenth of ten - that's dead last," said Brady. The commentary section of today's Washington Times contains an op-ed on the forthcoming centennial of Milton Friedman's birth, written by Heritage Foundation president Ed Feulner. He would have been 100 on July 31. "At a time when it was fashionable to assert that collectivism was the wave of the future, he championed the moral and practical superiority of free markets . . . And when others looked to government to accomplish their social objectives, he reshaped American politics through his advocacy of monetary restraint, deregulation, the volunteer army, school choice and the flat tax." "Friedman’s parents emigrated from a province of the Austro-Hungarian Empire in the late 19th century." "His work on monetary policy soon became legendary and led to the founding of the Mont Pelerin Society, among other accomplishments. “People at MIT and Harvard didn’t know what they were going to work on until Milton made a speech,” said a fellow University of Chicago Nobel laureate, the now-deceased George Stigler. His influence transformed an academic department into a movement, the “Chicago School,” of which Friedman was the spiritual leader." Finally, Feulner says that Friedman "thoroughly discredited the idea, common since the Great Depression, that capitalism is inherently flawed and requires the “fine-tuning” of government to avoid excess and disaster. This has been the central conceit of the Keynesian state, administered by educated sophists, adjusting tax-and-spend policies to tame the business cycle. Friedman attacked these beliefs at their root. He argued that the Great Depression was not caused by the “defects” of capitalism, but by government incompetence." In a weekend, edition, the New York Times published a review of Neil Barofsky's book, "Bailout," written by Gretchen Morgeonson, assistant business and financial editor for the Times and co-author of "Reckless Endangerment." "As Mr. Barofsky writes, he had assumed that his assignment to oversee TARP meant that he should be fiercely independent from the Treasury Department, and vigilant against waste, fraud and abuse. But after canvassing other inspector generals for guidance, he writes, he learned of different priorities: maintaining and possibly increasing budgets, appearing to be active — and not making enemies. "“The common refrain went like this,” Mr. Barofsky writes. “There are three different types of I.G.’s. You can be a lap dog, a watchdog or a junkyard dog.” A lap dog is seen as too timid, he was told. But being a junkyard dog was also ill-advised. 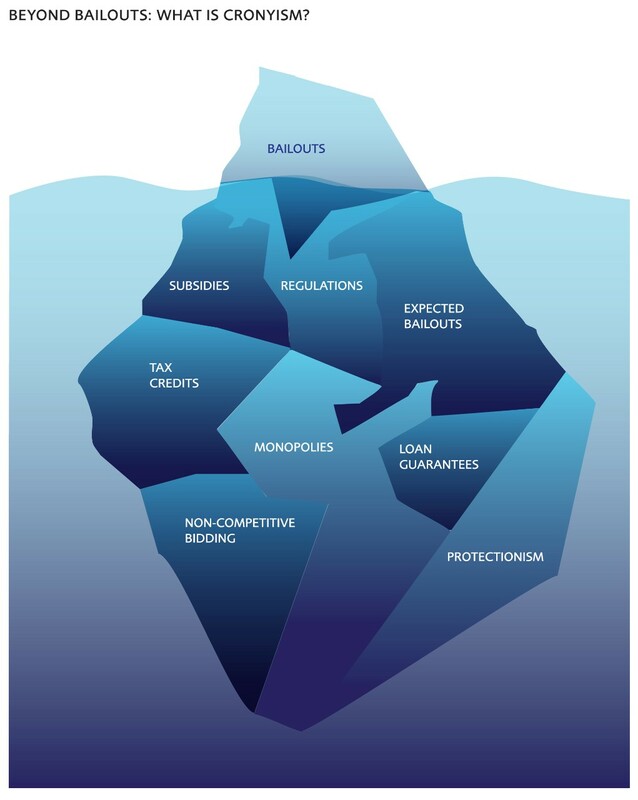 Bailout looks to be a most interesting read according to Ms. Morgenson's review. Based upon Barofsky's comments about the Inspectors General, it's clear why there seems to be so much waste, fraud, and abuse in the federal government. For more on the Office of the Special Inspector General for the Troubled Asset Relief Program, click here. "Northern Virginia remains the economic engine of the state but it faces major challenges. Job creation isn’t keeping up with population growth and income inequality is growing, concludes the Commonwealth Institute in a new report, 'Under Pressure: The State of Working Northern Virginia.'" "Employment grew at a strong pace in 2011: The region added 25,000 jobs, a job-creation rate of 1.9%. But the “jobs gap” — the number of jobs needed to return to a pre-recession unemployment rate — stood at almost 100,000 in 2011. "Northern Virginia’s dominance as a national and international business center contributes to its reputation as the great economic engine of Virginia. Parts of the region have some of the highest incomes in the nation, and the educational attainment rates of the workforce make it one of the most educated regions in the world. But a closer look at the dynamics of the Northern Virginia economy shows that not all workers and industries are benefitting from this success. While conditions have deteriorated for many workers – cuts in hours, reduced employment opportunities, income losses, and rising prices – even the most well-positioned workers in the region are operating under increased pressures brought on by the Great Recession and its lingering effects. "This report focuses on key measures of the economy critical to understanding how the workforce is faring in Northern Virginia. 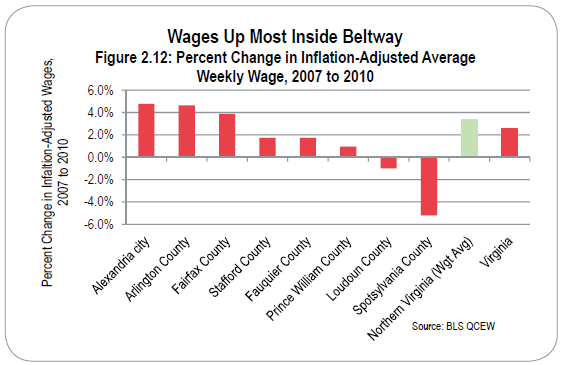 By examining the most recent data available from the Census Bureau and the Bureau of Labor Statistics, The State of Working Northern Virginia highlights where Northern Virginians are working and how much they earn, and then places that in the context of what it costs to live in this rapidly expanding metropolitan area. By casting light upon the challenges and opportunities facing workers in Northern Virginia, this report aims to advance the policy debate so that Northern Virginia can move beyond the downturn and continue to grow into a robust, thriving, and sustainable economy that produces a high quality of life for all." By the way, note the write-up for Jim's book, Boomergeddon, in the right column. You can obtain it at Barnes & Noble. Both socialists and capitalists have been at odds with each other over assigning blame to the opposite group for the rise of crony capitalism. Socialists believe that crony capitalism is the inevitable result of pure capitalism. This belief is supported by their claims that people in power, whether business or government, look to stay in power and the only way to do this is to create networks between government and business that support each other. On the other hand, capitalists believe that crony capitalism arises from the need of socialist governments to control the state. This requires businesses to operate closely with the government to achieve the greatest success. “In a new paper called "The Pathology of Privilege: The Economic Consequences of Government Favoritism," my colleague Matt Mitchell explains that "Whatever its guise, government-granted privilege [to private businesses] is an extraordinarily destructive force. It misdirects resources, impedes genuine economic progress, breeds corruption, and undermines the legitimacy of both the government and the private sector." “Take the Department of Energy’s 1705 loan guarantee program, for instance. That’s the program that extended $535 million in loan guarantee to Solyndra, a Solar Company that went under last summer leaving taxpayers with the tab. Since then, two additional companies—Beacon Power Corp and Abound Solar—have announced that they would suspend operations and filed for bankruptcy. Abound, had used about $70 million out of the $400 million it got through the DoE program, which is likely to result in a cost of $40 million to $60 million to U.S. taxpayers after Abound’s assets are sold and the bankruptcy proceeding is completed. “Despite this, Democrats and some Republicans refuse to make the program go away. They defend it on two grounds. First, advocates argue that renewable energy companies do not have access to sufficient credit to support new projects. In addition, the DOE argues that encouraging investment in green technology would create up to 5 million jobs. At the Government Accountability Institute, Peter Schweizer posts an article he wrote for The Daily Beast in which he explains how crony capitalism has creeped into the Defense budget. Columbia Pike Streetcar: $40 Million per Mile. Climbing? Today's Arlington Sun Gazette reports the cost of Arlington's share of the Columbia Pike streetcar the Arlington County Board is just under $40 million for each of the five miles. The Board is expected to approve both the Columbia Pike Neighborhoods Plan and the Columbia Pike Transit Initiative on Monday evening (items #48 and #49, respectively, on the Board's Monday evening, July 23, 2012, agenda). "The total of $198,999,000 is part of a revised 10-year, $2.5 billion capital-improvement package that will, once adopted, guide big-ticket spending in coming years. "The streetcar cost anticipates both federal and state financial support for the project, neither of which have been committed. It also includes local support through revenue bonds that will be backed by the Transportation Capital Fund, which is funded by a surtax on commercial real estate. County officials expect to start issuing revenue bonds – which do not require voter approval – in 2014. "Arlington is partnering with Fairfax County on the Columbia Pike streetcar project, which would link Pentagon City with Baileys Crossroads and, potentially, beyond. Arlington will provide most of the funding. "County Board members are expected to adopt the 10-year capital plan on Saturday, then formally move ahead with the streetcar project in a vote slated for Monday night. "County officials also expect to need an additional $146 million to fund a proposed streetcar line in Crystal City. Arlington officials are not seeking federal funds for that project, instead largely opting for tax-increment financing that taps into increased real estate values on Crystal City, Pentagon City and Potomac Yard properties. One-third of revenue brought in through increased assessments on that property will be dedicate to transit." The Board masterminds are expected to adopt the most expensive alternative, i.e., the streetcar alternative, rather than the far less expensive bus or the articulated bus alternatives. You can still weigh-in with the Board by calling their Courthouse Plaza office -- (703) 228-3130. You can find more information in our Growls of June 17, 2012 and July 8, 2012. "The Mexican government has been working with the United States Department of Agriculture to increase participation in the Supplemental Nutrition Assistance Program (SNAP), or food stamps. "USDA has an agreement with Mexico to promote American food assistance programs, including food stamps, among Mexican Americans, Mexican nationals and migrant communities in America. "The partnership — which was signed by former USDA Secretary Ann M. Veneman and Mexican Secretary of Foreign Affairs Luis Ernesto Derbez Bautista in 2004 — sees to it that the Mexican Embassy and Mexican consulates in America provide USDA nutrition assistance program information to Mexican Americans, Mexican nationals working in America and migrant communities in America. The information is specifically focused on eligibility criteria and access. "The goal, for USDA, is to get rid of what they see as enrollment obstacles and increase access among potentially eligible populations by working with arms of the Mexican government in America. Benefits are not guaranteed or provided under the program — the purpose is outreach and education." But don't worry, the Daily Caller concludes, saying, " When asked for details and to elaborate on the program, USDA stressed it was established in 2004 and not meant for illegal immigrants." Besides, we're only borrowing 40 cents of the money needed to pay for these extra food stamp benefits. Sheesh! Fox News this evening is reporting that: "Sen. Jeff Sessions, R-Ala., top Republican on the Senate Budget Committee, raised concerns about the program in a letter to Agriculture Secretary Tom Vilsack -- one week after he complained about a Spanish-language ad campaign encouraging residents to go on food stamps." For the Washington Examiner, Joel Gehrke reports that "USDA gets secretative about Mexican food stamp partnership." At Power Line today, John Hinderaker opines, "The Obama administration’s push to expand the food stamp program is of a piece with its casual elimination of welfare work requirements. The more people dependent on government, the better. And these actions dovetail with Obama’s belief that those who prosper in America didn’t really build their businesses, but rather succeeded, whether they realize it or not, through government largesse and government sufferance. Since government help is the sine qua non, why should it be withheld from anyone? Like the grace of God, it cannot be earned but can only be bestowed. Thus does Barack Obama’s political philosophy pervade every aspect of his administration." Finally, at Human Events, John Hayward writes, "It’s curious that this Administration has been willing to work so closely with the Mexican government on expanding food stamp dependency in the United States, but couldn’t be bothered to notify Mexican authorities of a deadly gun-running program that killed over 300 of its citizens." “Most journalists will swear that, despite the fact they vote Democratic, they treat both sides fairly. Indeed, it is a rare event to read a news article that directly attacks the Republican party or one that praises the Democratic party. “(T)he last two weeks have given us an excellent test case of whether, and to what extent, the media is biased in this way. Just ten days ago, we received an utterly terrible jobs report, which reinforced the suspicion that the economy might once again be falling into recession. This could have substantial second-order effects on public policy, especially the deficit, and call into question the efficacy of the Obama administration's policies. “In other words, talking about the rotten economy is bad for this president. "So, the media – following cues from the Democratic party – has pursued an alternative storyline: Mitt Romney is rich! He worked at a firm dealing in high finance! His money is invested overseas! “To be clear, these are legitimate storylines to pursue. Indeed, that is the typical response we hear from journalists, who argue that this is just part of the vetting process, a noble journalistic duty. Instead, the timing of these otherwise legitimate inquiries is biased. There was a bad narrative out there for the Democratic party, but it has been replaced with a bad narrative for the Republican party. “After all, Mitt Romney has basically been running for president for five years. Why are these stories about Bain Capital cropping up now? It is not as though the “scoops” in these stories were that hard to come upon; everything is in publicly available documents filed with the federal government. “Generally speaking, we can perceive media bias on a whole different level when we start asking ourselves, “Why is the public discourse revolving around this question at the moment? Whom does this help?” This is where we can often see the alliance between the mainstream media and the Democratic political class. Journalists do not bend facts to support their ideological allies, but they ask questions that help them. More Gloomy Economic News; LIBOR Scandal, Too? In testimony today before the Senate Banking Committee, Reuters reports that Federal Reserve chairman Ben "Bernanke told the Senate Banking Committee the economic recovery was being held back by anxiety over Europe's debt crisis and the path of U.S. fiscal policy, and he expressed unease over a stagnant jobs market," and "provided few concrete clues on whether the U.S. central bank was moving closer to a fresh round of monetary stimulus." "Bernanke said the risks of a surge in inflation were low and that there was a modest risk of a broad-based decline in prices. "He said Fed policymakers would consider a range of tools to further stimulate growth if it became clear the labor market was not improving or if deflation risks mounted. "He cited the possibility of additional bond buying -- whether Treasury debt or mortgage-backed securities -- lending through the Fed's emergency loan window, and lowering the rate the Fed pays banks on reserves held at the central bank. The Fed could also use communications tools, such as extending its pledge to hold rates exceptionally low, Bernanke added. "He said recent deterioration in the labor market suggests the nation's 8.2 percent jobless rate will come down all too gradually, saying for the first time the softness in hiring could not be explained away by purely seasonal factors." "Bernanke told lawmakers it was essential to find a way to avoid the "fiscal cliff" of sharp spending cuts and tax hikes that are scheduled to take place in the United States at the start of next year, warning it could tip the already weak economy into a recession." "If attempts to manipulate LIBOR were successful—and the regulators think that Barclays did manage it, on occasion—then this would be the biggest securities fraud in history, affecting investors and borrowers around the world. That opens the door to litigation not just by the direct customers of implicated banks, but by anyone with a financial interest in LIBOR." "What progressives continually fail to understand is that you can have 30 Dodd-Frank "reform" efforts, but if regulators are in at least tacit collusion with corrupt bankers, the entire regulatory edifice is pointless. "The Obama Administration has known from day-one that some banks were manipulating a foundation of the financial system for their own benefit. And they did nothing." Sounds like there will be a lot of clean-up work after the elections on Tuesday, November 6, 2012. If you're not registered to vote in Arlington County, check out the website of the Office of Voter Registration, or call them at (703) 228-3456. UPDATE (7/17/12): Here is Bloomberg's report on what Bernanke said at the Senate Banking Committee hearings. It includes a news video that lasts just over one minute. In addition, Joel Gehrke reports at the Washington Examiner that "Sen. Chuck Schumer, D-N.Y., exhorted Federal Reserve Chairman Ben Bernanke to stimulate the economy before November through some form of quantitative easing or other monetary policy, which Bernanke said could create jobs." (HT to Drudge for both). “The U.S. Department of Health and Human Services announced last week that it will consider requests from states that wish to waive the requirement, which was at the heart of the 1996 welfare-reform law negotiated between congressional Republicans and President Clinton. “Administration officials say the change will give states more flexibility in developing new reforms, but GOP lawmakers argue the move is an illegal “power grab” aimed at undoing progress made under the current law. “How exactly the HHS change will play out is unclear. In Thursday's policy directive, the department said the states may seek a waiver from the work component of the Temporary Assistance for Needy Families Program, in order to "test alternative and innovative strategies, policies and procedures that are designed to improve employment outcomes for needy families." “HHS stressed that any alternative should still aim to get welfare recipients into gainful employment. Any plan that "appears substantially likely to reduce access to assistance or employment for needy families," will not be approved, the memo said. “Welfare reform replaced the old Aid to Families with Dependent Children with a new program, Temporary Assistance for Needy Families (TANF). The Heritage Foundation played a pivotal role in building bipartisan consensus for the reform and providing many of the recommendations that became part of the law. The whole point was that able-bodied adults should be required to work or prepare for work as a condition of receiving welfare aid. “This reform was very successful. TANF became the only welfare program (out of more than 70) that promoted greater self-reliance. It moved 2.8 million families off the welfare rolls and into jobs so that they were providing for themselves. Child poverty fell, and single-parent employment rose. Recipients were required to perform at least 20–30 hours per week of work or job preparation activities in exchange for the cash benefit. In its Monday Morning Brief, the Patriot Post writes about the undoing of welfare reform. “There can be no mistake now: the Obama administration is seeking to create a permanent majority of Americans receiving money from taxpaying, working Americans. Food stamps are hyped through advertising, work requirements are being sabotaged (contrary to law), unemployment insurance extended for years. “If you work hard, pay taxes, and obey the law, you are a target. If you give up, call yourself a victim, and demand money that other people earned, you are part of the new dependant majority that will keep Democrats in power forever, or so they must hope. Representative Jim Moran -- write to him or call (202) 225-4376. Washington Examiner. Joel Gehrke's Beltway Confidential. Washington Examiner, columnist Byron York. Salon, Alex Pareen wonders, "Why are conservatives and triangulating Democrats suddenly worried that Obama has killed Clinton's welfare reform? Talking Points Memo says Republicans are attacking the President "for giving states flexibility on welfare reform. Jennifer Rubin, blogging at the Washington Post's Right Turn blog, writes, "Obama's imperious use of executive orders and refusal to enforce the laws of the land fairly and completely is a constitutional disgrace. But his policy judgment is so off-kilter that it also demonstrates Obama’s faulty approach to immigration, welfare, administration of justice, etc. The policy implications are far more politically damaging and reinforce conservatives’ fears that a second Obama term would witness a lurch to the left." "Every year, the Americans for Tax Reform Foundation and the Cost of Government Center calculate the Cost of Government Day. This is the day on which the average American has earned enough gross income to pay off his or her share of the spending and regulatory burdens imposed by government at the federal, state, and local levels. "From a different perspective, the cost of government makes up 54.0 percent of annual gross domestic product (GDP)." "Cost of Government Day (COGD) is the date of the calendar year on which the average American worker has earned enough gross income to pay off his or her share of the spending and regulatory burden imposed by government at the federal, state and local levels. "The Cost of Government Day for 2012 is July 15. On average, workers must labor 197 days out of the year to pay for all the costs imposed by the government. From a different perspective, the cost of government makes up 54.0 percent of annual gross domestic product (GDP). "Cost of Government Day falls three days earlier than last year’s revised date of July 18. In 2012, the average American will have to work an additional 29 days to pay off his or her share of the cost of government compared to ten years ago in 2002, when COGD was June 16. "In fact, between 1977 and 2008, COGD had never fallen later than June 26. 2012 marks the fourth consecutive year COGD has fallen in July. The difference between 2008 and 2009—from June 23 to July 17—was a full 24 days. The increase was spurred by massive government intervention in the form of the Emergency Economic Stabilization Act (EESA) that created the Troubled Asset Relief Program (TARP) and passage of the American Recovery and Reinvestment Act of 2009 (ARRA). "While 2012 marks the second consecutive year of an earlier COGD, this trend will only be temporary absent lasting and institutionalized spending reform. The start of the 2012 fiscal year came and went once again without a federal budget in place and the threat of bankrupt entitlement spending continues to loom large. What’s more, the largest tax hike in the nation’s history is scheduled to take place at the end of 2012 unless Congress acts to protect taxpayers. If this tax increase is allowed to hit, COGD could permanently be pushed back into August and beyond." UPDATE (7/15/12): At Townhall.com, Helen Whalen Cohen offers congratulations to citizens, adding, "You have officially finished paying off the cost of government for 2012 today." "Competition is the magic ingredient that makes capitalism work for everyone. Most of the elegant results that economists have derived about the benefits of free markets are based on the assumption that markets operate competitively. But economists do not focus sufficiently on the goal of ensuring that the competitive condition is met in practice. The problem is not the temporary advantage that companies secure through innovation but, rather, the longer-lasting political power they can secure through their size and lobbying influence. When companies operate in a noncompetitive market and are run by managers accountable to nobody, we should stop thinking of them as parts of a free market and see them instead for what they really are: small, centrally planned economies." ~ Luigi Zingales, page 29, "A Capitalism for the People"
In the Commentary section of today's Washington Times, U.S. Rep. Tom McClintock (R-Calif) has an op-ed saying that "Americans will pass final judgment on Obamacare come Election Day." "In reaching its conclusion, the court obliterated a fundamental distinction between a penalty and a tax. Congress has the power to lay and collect taxes, and therefore, the court reasons that it can apply a tax for any purpose, even those otherwise outside the confines of the Constitution. "In this case, the court ruled that Congress could not pass a law requiring citizens to purchase a government-approved health plan under the Commerce Clause, but it can enforce exactly the same requirement through a tax. Government cannot fine you for disobeying an otherwise unconstitutional edict, but it can tax you for disobeying it. "Whether the government enforces a law with a tax or a fine, the effect is the same: it is coercing behavior under the threat of confiscating one’s property. But there are two profound differences that ought to alarm every American, whatever their views on Obamacare. "First, if the government enforces the law through a fine, the burden of proof is on the government to prove that the individual actually broke that law. As a tax, the burden of proof is on the individual to prove that he obeyed it. Anyone who has ever undergone an Internal Revenue Service audit knows exactly what this means. Whenever the new doctrine is applied, it upends the most cherished principle of our justice system: the presumption of innocence. "There is a second, even more chilling difference between a penalty and a tax: Under our Constitution, no penalty can be assessed without due process - every American has a right to a day in court before being punished. But a tax can only be challenged in court after it has been paid - that is, after the punishment has been imposed." According to McClintock, "This is the madness of the Queen of Hearts in Lewis Carroll's “Alice’s Adventures in Wonderland” brought to life: “Sentence first - verdict afterwards.” More specifically, McClintock says, "There do not appear to be any bounds in the application of this new legal doctrine." Remember to vote on Tuesday, November 6, 2012. If you have any questions, information is available at Arlington County's Office of Voter Registration. Their phone number is (703) 228-3456. A new Tax Foundation paper (Fiscal Fact No. 318, June 29, 2012) provides highlights from the latest IRS report on America's 400 top earners. 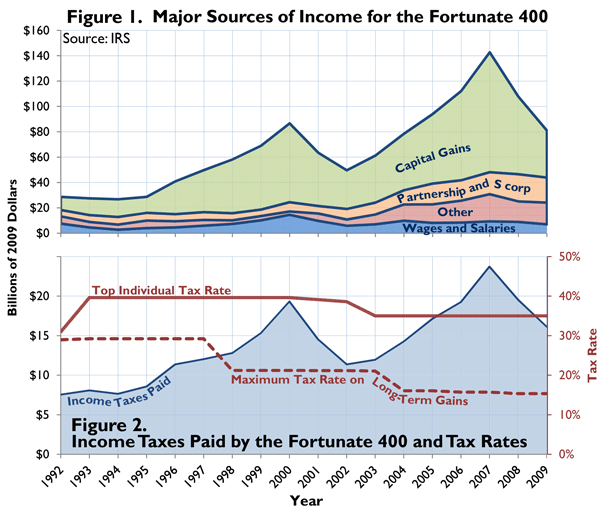 The Tax Foundation notes that "(s)ince 1992, the IRS has tracked the top 400 earners in terms of adjusted gross income—the so called fortunate 400." " . . . this IRS report demonstrates there is a lot of income mobility at the top. Of all the filers who have made the list since 1992, 73 percent were on the list just once. Virtually no one remains on the list for all 18 years, but for privacy concerns the IRS did not report exactly how many did, if any. In last year’s report, just 4 people remained on the list for all 17 years. This suggests that most top earners do not have a portfolio of big investments that can be cashed in year after year, but rather one big asset, such as a family farm or business or stock, the sale of which triggers a capital gain." The following figure "shows total adjusted gross income (AGI) for the fortunate 400, in real terms from 1992 to 2009, broken down by major source. Total income has more than doubled, from $29 billion in 1992 to $81 billion in 2009. On a per return basis, income went from $72 million in 1992 to $202 million in 2009." "Numerous reports have pointed to the growth in high incomes over the last few decades. However, at least among the highest income earners, the fortunate 400, there has been no growth in wages since 1992. Rather, virtually all of the growth is from pass-through business income and capital gains. The volatile nature of this income, particularly capital gains, means that high-flier status is fleeting. Most members of the fortunate 400 remain so for just one year, likely because of the sale of one big asset, such as a family farm, business, or stock. "The fortunate 400 pay a lot of income tax—about enough to fund the National Science Foundation and the Department of Interior, which includes the National Park Service. At the peak in 2007, they funded the State Department. Taxes have doubled, in real terms, since 1992. Likewise, the fortunate 400’s share of income taxes paid has doubled to 2 percent—almost the share paid by the bottom 69 million filers." Kudos to the Tax Foundation for a highly informative paper. Take a few minutes to review the complete report. You'll have the information to refute the claims of liberals who "want the 'rich' to pay their fair share, but have a) no idea what "fair share" means b) have no idea how much the "rich" already pay," as Katie Pavlich phrases the issue at Townhall.com. She also has a video posted there to prove her point. ~ Luigi Zingales, page 254, "A Capitalism for the People"
One year vs. permanent? Hmmm, no politics involved there, though. We’re sure. “If you still think raising taxes on the rich is fair, you might want to consider a few things. “First, raising taxes on the rich won't make even a small dent in our $1 trillion plus annual deficits. So as a fiscal policy, it's useless. “Second, many of the top 2% earning families already face marginal tax rates as high as 35%. The top 2% pay nearly 50% of all income taxes, but take home less than 30% of all U.S. income. Is that fair? “The "rich" Obama wants to increase taxes on are the job creators and entrepreneurs. The top 2% of earners report 66% of all pass-through business income, 25% of all net business and professional income, and 85% of all partnership and S Corp. income. “They're business owners. Tax them at a higher rate, and you'll have fewer new businesses and fewer jobs. It's the middle-class that will suffer, not the rich. "Twice in his brief speech he pointed out that we need to enact this cutoff because "we cannot afford to spend on tax breaks for the wealthy." Those words should frighten and arouse anyone who has an income. They are not ill-chosen words; they are a look into the very political and economic heart of the current president and his regime. Allowing income earners to keep a portion of their money is considered by them to be spending by the government. In other words, all of your money is theirs to spend. They spend it on their special programs, their cronies, their allies and their adoring lapdogs. They spend some of it on the producers in order to keep the well flowing." To see another quotation from one of Mr. Jefferson's letters to John Taylor, see this June 29, 2012 Growls. "Board members are slated to vote on designating the streetcar system the “preferred alternative” for the Columbia Pike corridor during what could become a marathon board meeting stretching over multiple days. "While the vote largely is pro-forma – few expect the board to reject the streetcar as the board’s preference over bus service – it is a necessary step before submitting an application for federal funds. "After the vote, officials will fill out the paperwork and wait to see if the Federal Transit Administration OKs funding of up to $75 million for the project, which could be operational in 2016 or 2017." "Tim Wise, president of the Arlington County Taxpayers Association and an opponent of the rail line, said he expects no surprises when elected officials vote. If you would like to learn more about the timing of various events that got us to this point, here is the May 22, 2012 press release. Information, both summary and detailed, about the Columbia Pike Transit Initiative is available at the county website. One especially useful summary is the 8-page executive summary for the alternativess analysis/environment assessment (requires Adobed). The Cato Institute last month published a “policy analysis” of the IPAB, subtitled, “PPACA's Anti-Constitutional and Authoritarian Super-Legislature” (Policy Analysis 700, June 14, 2012). The authors are Diane Cohen, senior attorney at the Goldwater Institute and Michael F. Cannon, director of health policy studies at the Cato Institute. “When a member of Congress introduces legislation, the Constitution requires that legislative proposal to secure the approval of the House of Representatives, the Senate, and the president (unless Congress overrides a presidential veto) before it can become law. In all cases, either chamber of Congress may block it. “In 2010, the Patient Protection and Affordable Care Act (PPACA) created the Independent Payment Advisory Board, or IPAB. When the unelected government officials on this board submit a legislative proposal to Congress, it automatically becomes law: PPACA requires the Secretary of Health and Human Services to implement it. Blocking an IPAB "proposal" requires at a minimum that the House and the Senate and the president agree on a substitute. The Board's edicts therefore can become law without congressional action, congressional approval, meaningful congressional oversight, or being subject to a presidential veto. Citizens will have no power to challenge IPAB's edicts in court. “Worse, PPACA forbids Congress from repealing IPAB outside of a seven-month window in the year 2017, and even then requires a three-fifths majority in both chambers. A heretofore unreported feature of PPACA dictates that if Congress misses that repeal window, PPACA prohibits Congress from ever altering an IPAB "proposal." By restricting lawmaking powers of future Congresses, PPACA thus attempts to amend the Constitution by statute. “IPAB's unelected members will have effectively unfettered power to impose taxes and ration care for all Americans, whether the government pays their medical bills or not. In some circumstances, just one political party or even one individual would have full command of IPAB's lawmaking powers. IPAB truly is independent, but in the worst sense of the word. It wields power independent of Congress, independent of the president, independent of the judiciary, and independent of the will of the people. The creation of IPAB is an admission that the federal government's efforts to plan America's health care sector have failed. It is proof of the axiom that government control of the economy threatens democracy. Read the entire 24-page policy analysis if you want to more fully understand why the IPAB is such a dangerous feature of ObamaCare. June Jobs Report. More Bad Economic News? “The Bureau of Labor Statistics said private payrolls increased 84,000, while the government lost 4,000 jobs. Economists expected job growth of about 100,000 and the unemployment rate to be unchanged, though many had increased their forecasts based on some recent indicators. “With yet another month of weak employment growth, the second quarter marks the worst three-month period in two years. The period averaged just 75,000 per month, against 226,000 in the first quarter, which benefited from an unusually mild winter. “May's weak initial 69,000 report was revised upward to 77,000, which made the June growth essentially the same. The April number was revised lower, from 77,000 to 68,000. "This continues to be the longest streak — 41 months — of unemployment of 8% or higher since the Great Depression. And recall that back in 2009, Team Obama predicted that if Congress passed its $800 billion stimulus plan, the unemployment rate would be around 5.6% today. "Just 75,000 jobs were created, on average, per month in the second quarter vs. 226,000 in the first quarter. And for the year, monthly job creation has averaged just 150,000 vs. 153,000 last year. Both numbers are extremely weak." "If the size of the U.S. labor force as a share of the total population was the same as it was when Barack Obama took office—65.7% then vs. 63.8% today—the U-3 unemployment rate would be 10.9%. Even if you take into account that the LFP should be declining as America ages, the unemployment rate would be 10.5%." "The broader U-6 unemployment rate, which includes “all persons marginally attached to the labor force, plus total employed part time for economic reasons,” is 14.9%, up a bit from May." "It will take 219,000 net new jobs a month for unemployment rate to be below 8% on Election Day if current participation rate holds steady." Pethokoukis has additional posts about jobs here (explaining why jobs gap may not close until 2030); here (break on jobs that may get President Obama reelected); here (the "7.6% unemployment barrier); and here (focusing on an HPS jobs fact sheet). "The crowd in Washington was quite confident that Keynesian spending was going to save the day, even though similar efforts had failed for Hoover and Roosevelt in the 1930s, for Japan in the 1990s, and for Bush in 2008. "Nonetheless, we were assured that the stimulus was needed to keep unemployment from rising above 8 percent. "Well, that claim has turned out to be hollow. Not that we needed additional evidence, but the new numbers from the Labor Department re-confirm that the White House prediction was wildly inaccurate. The 8.2 percent unemployment rate is 2.5 percentage points above the administration’s prediction. Breitbart's Big Government: First, John Nolte opines, “If Republicans are looking for a way to compare Barack Obama to Jimmy Carter, look no further than the President's bizarre and dispiriting speech after today's devastating jobs numbers were released.” Nolte then goes on to opine on comments the President made this morning to a small group in Ohio ripping the Clinton era. Finally, Mike Flynn analyzes the June jobs report itself. Heritage Foundation. At their blog, The Foundry, Amy Payne provides more context on the "jobs drought." She also has a more in-depth version of the above chart provided by Dan Mitchell. There is also a much more in-depth, 5-page analysis of the June jobs report (Issue Brief #3655, July 6, 2012). Canada's Globe and Mail's analysis is here. At the New York Times blog, 538 Political Calculus, Nate Silver asks: 1) Will the Federal Reserve act? ; 2) Is this a new normal? ; and, 3) Is this a political 'game changer'? At the Wall Street Journal today, Ben Casselman thinks the "increase of just 80,000 jobs reflects recovery's fragility and steps up pressure on Fed to act." Finally, in a Wonkblog at the Washington Post, Dylan Matthews reports on the "jobs report in five charts, including one on alternative unemployment measures, e.g, U3, U6, etc., and the one immediately below on the various employment sectors. If you're wondering how close the November 6, 2012 elections really are, there are only four more of these jobs reports, which seeming will loom large on the minds of most voters. At least according to Rasmussen Reports, which reports the economy ranks first on 10 key issues. "With the Supreme Court giving President Obama's new health care law a green light, federal and state officials are turning to implementation of the law -- a lengthy and massive undertaking still in its early stages, but already costing money and expanding the government. "The Health and Human Services Department "was given a billion dollars implementation money," Republican Rep. Denny Rehberg of Montana said. "That money is gone already on additional bureaucrats and IT programs, computerization for the implementation." "Oh boy," Stan Dorn of the Urban Institute said. "HHS has a huge amount of work to do and the states do, too. There will be new health insurance marketplaces in every state in the country, places you can go online, compare health plans." "The IRS, Health and Human Services and many other agencies will now write thousands of pages of regulations -- an effort well under way. "There's already 13,000 pages of regulations, and they're not even done yet," Rehberg said." Tell me again. How is ObamaCare going to improve the quality of care, let alone "bend the cost curve" down? The following paragraphs are from an essay by Edward Hudgins, director of regulatory affairs at the Cato Institute. It originally appeared on Cato.org on July 3, 1998. "We celebrate July Fourth as the day the Declaration of Independence created the United States. But in my heart I also honor July 15. On that day in 1930 Giustino DiCamillo, my grandfather, arrived here with my grandma, aunts and an uncle to start their lives as Americans. My mom was born the next year. 'I never had the chance to hear my grandpop's deepest thoughts about his extraordinary journey and rich, long life, which ended when I was fairly young. But one way I can understand his character, and the character of my country, is to reflect on the question, "What is an American?" 'An American is anyone who loves life enough to want the best that it has to offer. Americans are not automatically satisfied with their current situation. My grandpop wanted to be more than a poor, landless tenant farmer, no better off than his ancestors. Americans look to more than the next meal; they look to the future, the long term, a better tomorrow. "An American is anyone who understands that to achieve the best in life requires action, exertion, effort. Americans aren't idle daydreamers; they take the initiative. Fortune did not fall into my grandpop's hands. He had traveled to America several times before 1930 to find work, establish himself, and make it possible to bring over the family. He toiled for years to achieve his dream, but achieve it he did." "Americans seek personal liberty, to live as they see fit, to worship as they please. Americans seek freedom from the use of power wielded arbitrarily by whoever holds the political sword. My grandpop no doubt did not want to be at Mussolini's mercy. "The Declaration -- and the Constitution that followed it -- created a political regime for individuals who wished to be united with their countrymen not essentially by a common language, ethnic background, or other accident of birth. Americans are united by a love of liberty, respect for the freedom of others and an insistence on their own rights as set forth in the Declaration. "Unfortunately, the American spirit has eroded. Our forebears would look with sadness at the servile and envious character of many of our citizens and policymakers. But the good news is that there are millions of Americans around the world, living in every country. Many of them will never make it here to the United States. But they are Americans, just as my grandpop was an American before he ever left Italy. And just as millions discovered America in the past, we can rediscover what it means to be an American. The principles of this country are no mere abstractions; they are written in the hearts of all true Americans. And it is the spirit of America, the spirit of my grandfather, that we should honor on July Fourth." "The Declaration of Independence was partly intended as a list of grievances against a distant monarch. And both George III and the colonists who disagreed with his rule are long dead. But so are many of those who’ve argued that the Declaration is obsolete. In fact, this is exactly what those who called themselves “progressives” were saying a century ago . "Something tells me that I won’t be the only American pondering some famous words uttered by Ben Franklin tomorrow as we celebrate the anniversary of our founding. "Franklin famously replied, “A Republic, if you can keep it.” This July Fourth falls in the shadow of the Supreme Court’s having upheld a law that augments the federal government’s already vast taxing powers and increases the government’s ability to intrude into our personal lives. Can we keep it? This is the question for Americans living in our time, but, of course it has always been the question, as, indeed, Franklin knew it would." Hays also points to another good read on what it means to be an American. Here's hoping your celebration of the Fourth of July is done in good health and safety. UPDATE (7/4/12): The Washington Free Beacon has a great video posted of CNBC's Rick Santelli offering a "special Independence Day message" in which he focuses on the meaning of the phrase "pursuit of Happiness" from the Declaration of Independence. It's only 2 minutes, 17 seconds long. More bad economic news this week? "New data suggests the three-year economic expansion — as anemic as it has been — may be at an end, or is at least perilously close. The Institute for Supply Management’s factory index unexpectedly fell to 49.7 in June from 53.5 a month earlier. A reading of less than 50 signals contraction. "Not one of 70 economists interviewed by Bloomberg thought it would be below 50.5." Mr. Pethokoukis' post includes a couple more charts worth looking at. "It was the first time since July 2009 that the index has fallen below the 50 mark that separates expansion from contraction. That was shortly after the U.S. economy emerged from recession. "Manufacturing has been one of the drivers of the U.S. economic recovery, which now appears to be losing momentum over fears about the euro zone's debt crisis, a slowdown in China and uncertainty over domestic fiscal policy. "Clearly this is the biggest sign yet that the U.S. is catching the slowdown that is well under way in Europe and China," said Paul Dales, senior U.S. economist at Capital Economics in London." Over the next few weeks, we'll continue growling about last Thursday's Supreme Court decision to uphold the Patient Protection and Affordable Care Act, sometimes referred to as ObamaCare (see our June 28, 2012 Growls). "The Court's dissenters also noted that the law was specifically passed with the mandate as a penalty, not a tax: "We cannot rewrite the statute to be what it is not. Although this court will often strain to construe legislation so as to save it against constitutional attack, it must not and will not carry this to the point of perverting the purpose of a statute ... or judicially rewriting it." Critics of the majority's decision will say for the foreseeable future that Chief Justice Roberts rewrote Obamacare to save it. Michael Carvin, who argued against Obamacare before the Supreme Court, noted dryly, "I'm glad he rewrote the statute instead of the Constitution." "Carvin's summary of the Supreme Court's ruling was on target: "What the Obama Administration… thought they were doing was completely unconstitutional; what they lied to the American people about was constitutional.… Unfortunately they got away with that bait-and-switch. A fraud has been perpetrated on the American citizenry." The Kaminsky article is worth reading in its entirety. "Nowhere at present is there such a measureless loathing of their country by educated people as in America."